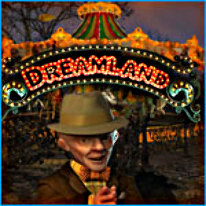 Welcome to dreamland-free, an old abandoned amusement park! There is an evil dwarf who lives here, who collects the souls of those who dare enter the neglected park. And he's got a plan on how to get your soul! Only you can rid the world from his presence, but it won't be easy. His traps and tests are waiting for you. You'll need to make your way around the park looking for useful things in all the old rides. There's no turning back now!